Deer Farm Demonstration Project opening day over subscribed – an extremely encouraging sign for the sector. The first day of the Deer Farm Demonstration Project will be held on Tuesday 15 April at Culquoich, Glenkindie, Strathdon courtesy of Ali Loder. The opening day, which is the first of five days spread across the year offering an insight into deer farming for those who might wish to diversify into deer either for venison production or breeding stock, has around 60 farmers, land managers and landowners registered, in addition to a number of specialists from the sector (and a waiting list to attend). The opening day provides a background to deer farming in general and includes an introductory walk and talk tour of Culquoich looking at certain areas in more detail such as farm layout, fencing and moving the deer; winter feeding; turning out in-wintered yearlings; an introduction to pasture management for deer; and an overview of the indoor handling system. As the project progresses its content will become more topic focused. The second day on 10 June has funding, finance and deer health scheduled as well as a number of seasonal on-farm topics. The Deer Farm and Park Demonstration Project is a two-year initiative built around a total of 10 demonstration days to encourage farmers, land managers and land owners to look at the opportunities of farmed and park deer. The UK retail market for venison is quoted as growing at between 10 and 25 per cent per annum but, even with ambitious plans to expand deer farming in Scotland and to increase output by an additional 1200 tonnes per annum by 2020, if the market continues to develop then the UK is still likely to become a net importer of venison by this time. “Scotland’s venison sector has yet to realise its full potential and the Scottish Government is committed to developing that promise and securing a sustainable future for the industry. The Deer Farm and Park Demonstration Project is a partnership initiative between Scotland Food and Drink, NFU Scotland, SFQC Ltd, the Scottish Venison Partnership and Culquoich Estate. A significant proportion of funding for the project has been made available through the SRDP Skills Development Scheme which is jointly funded by the Scottish Government and the European Union. Following a rigorous selection process, Culquoich Farm, Glenkindie, Aberdeenshire (Ali Loder) has been selected as the base for this year’s Deer Farm Demonstration Project, the opening day of which will be Tuesday 15 April 2014 from 10:00am. The demonstration project is a headline aspect of the strategy to stimulate increased Scottish venison production from deer farms and deer parks. With the cull of Scotland’s wild red deer — the main source of venison produced in the UK — currently static and forecast to decline, increasing the number of deer farms in Scotland provides a logical alternative to take advantage of a UK venison market that has been quoted as currently growing at more than 20 per cent per annum. The Deer Farm Demonstration Project is thought to be the first initiative of this type in the UK. The project will consist of 5 day-long visits spread across the deer farming year to serve as an introduction to deer farming for those interested in diversifying into the sector. The programme will consist of presentations on all aspects of deer farming in Scotland, with practical demonstrations, training and information exchange. Those considering entering deer farming will be able to hear from those who have already taken that step and other industry experts – the risks, challenges, funding and finance, routes to market etc. 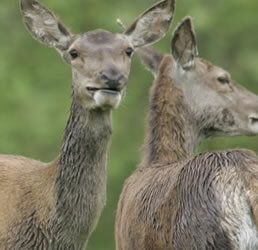 Deer have been actively farmed at Culquoich since 2004 with approx 190 acres fenced for deer. The Culquoich deer herd currently numbers around 280 animals. The rationale of the business is to produce deer of the highest quality both for venison production and breeding stock for sale to other farms. An overview of deer farming in Scotland and current opportunities. The demonstration farm — the Culquoich story. The venison market and future predictions. Assessing body condition of hinds. winter feeding and an introduction to pasture management for deer farming. There will be ample opportunity for questions and discussion. The project is a joint initiative between Scotland Food and Drink, the Scottish Venison Partnership, SFQC Ltd, NFU Scotland and Culquoich Farm. Funding for the project has been made available through the SRDP Skills Development Scheme which is jointly funded by the Scottish Government and the European Union. The programme is being facilitated by the Venison Advisory Service Ltd.
See http://deerfarmdemoproject.scottish-venison.info/ for more details about the project. To register to attend on the day please email mail@scottish-venison.info or call Playfair Walker on 0131 445 5570 by Tuesday 8 April 2014. * Programme may be subject to change.